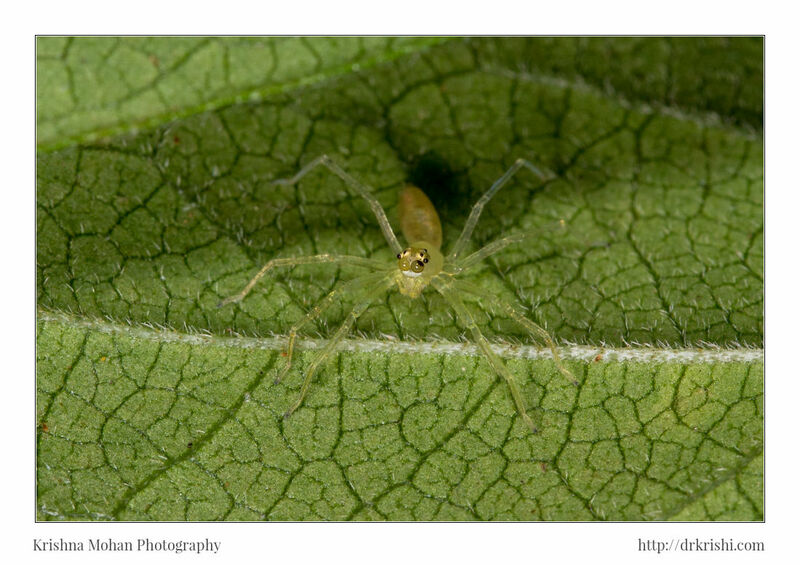 I found this tiny spider under the leaves of Jamaica Cherry (Muntingia calabura) tree. 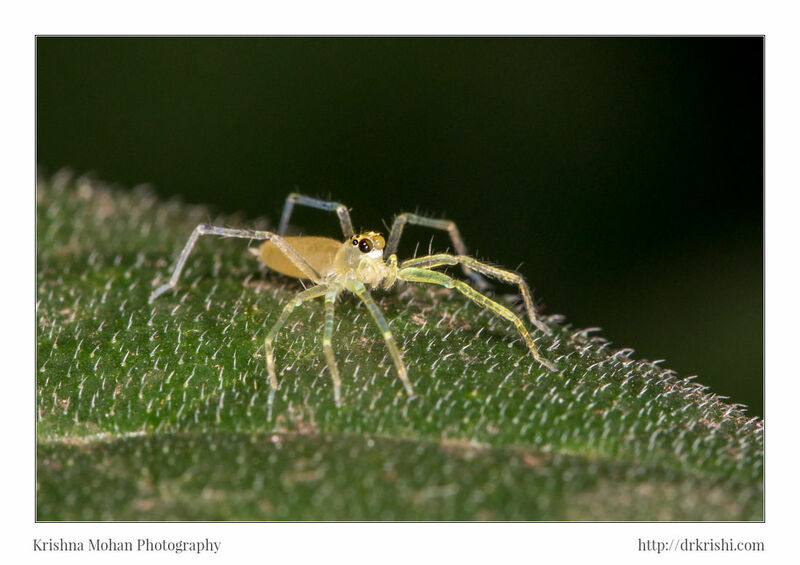 The spider was hardly 2mm in size. 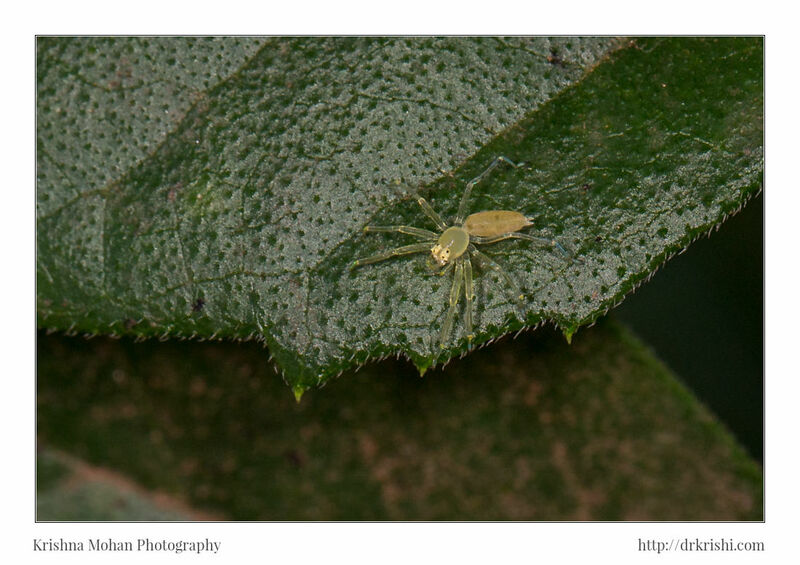 This shy and reclusive spider tried hiding from my view by going around the leaf in circles. I was able to capture it with lot of difficulty. Here are five photos I could manage out of the 100 odd failures. Getting a good capture involves lot of failures. Failures should not deter you. In fact every failure should inspire you more towards that ultimate goal of good capture. Following it gently as it moved around while having a tiny depth of field is a difficult task. 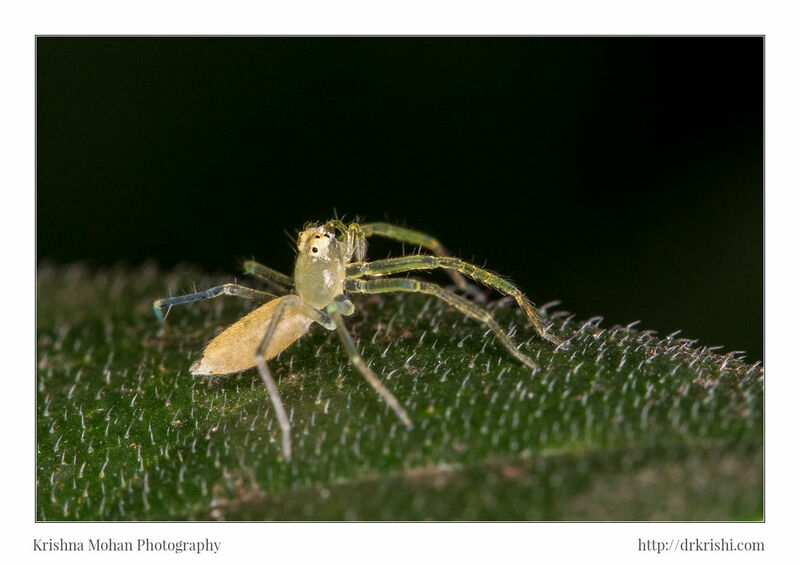 I was using Canon EOS 5D Mark III with 36mm Kenko extension tube on my Canon EF 100mm f/2.8L Macro IS USM lit by Canon MT-24EX macro twin light flash. Any rapid jerky movement is bound to startle it and ruin your chances of capture. Keeping patient and waiting for it ignore you is the best way. Jumping spiders are very curious and their large eyes can sense your movements much faster. They are also very quick to react to movement or flash bursts. Abdomen of male elongated, golden yellow in colour having a reddish-orange patch flanked with a white broad spot near the tip. Two spherical lobes formed of shiny black hairs present at the tip on either side. Spinnerets slender, extraordinarily longer than seen in salticids and provide a ‘tailed appearance’ to the spider. Abdomen of female cream coloured. Epigyne pale brown, sclerotised and conspicuous. 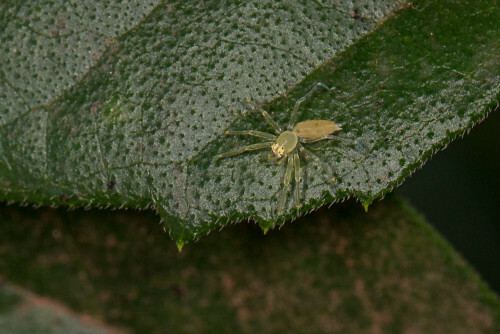 The genus Asemonea represents the subfamily Lyssomaninae in the Afrotropical Region. The eyes in this group of spiders are arranged in four rows and tracheal system in the majority of species is confined to the abdomen. 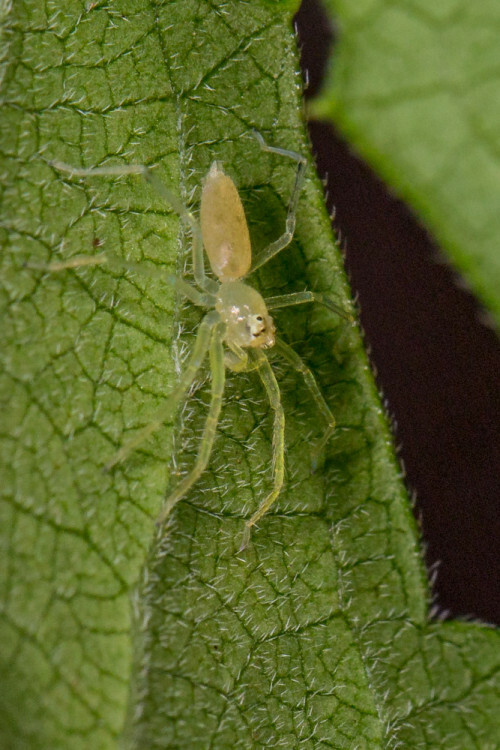 Their biology is rather poorly known but they are usually found among leaves, well disguised by their light coloration (generally yellow or green). Some of the lyssomanine salticids use a sheet web to capture prey. This set of characters – rather exceptional for the salticids – could justify establishment of separate family – the Lyssomanidae for them. 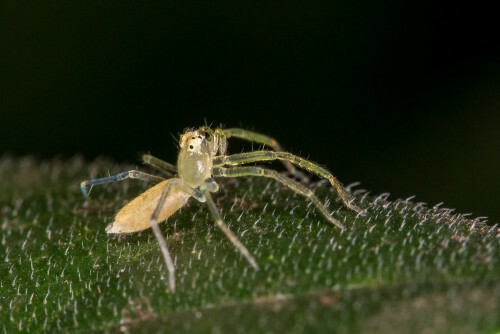 However, after detailed analysis of their morphological features, redefined the group and suggested retention of its subfamilial rank within the Salticidae. 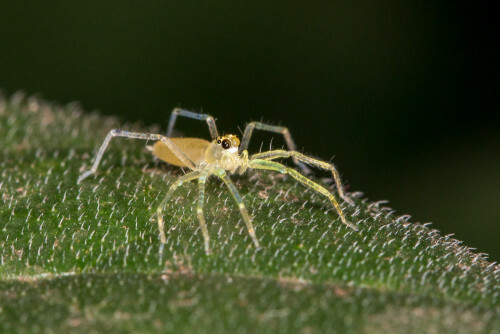 It is not a very common spider, usually seen under broad leaves of small trees along slightly hilly places. 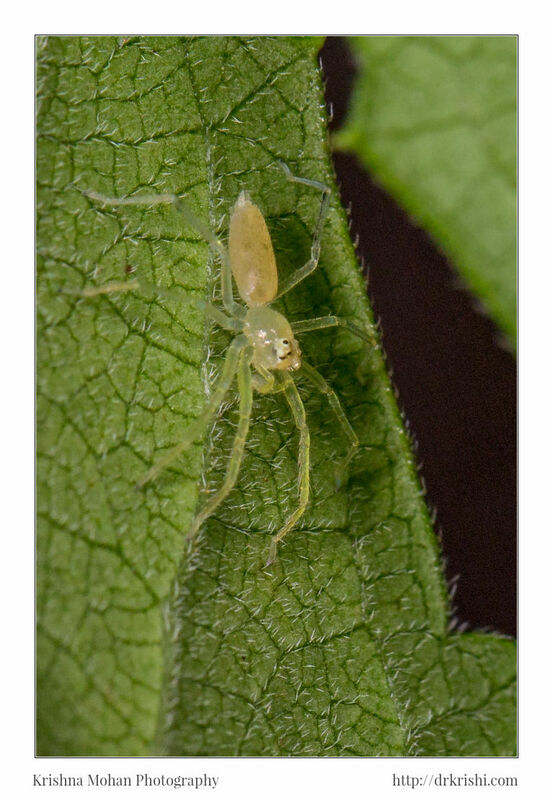 Female is usually encountered on under surface of leaves below a thin, small sheet-like almost transparent silk retreat and the male nearby it or on the upper surface of the same leaf. 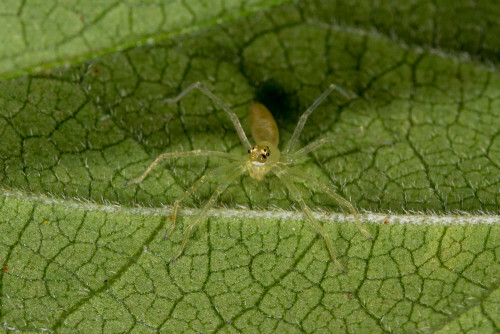 Males usually run slowly over the leaves in sunshine. They are easily noticeable due to the slender body shape, bright colouration and the small, black ‘tail’ formed of the spinnerets. EXIF info - Aperture : ƒ/11 | Camera : Canon EOS 5D Mark III | Taken : 4 May, 2014 | Flash fired : yes | Focal length : 100mm | ISO : 400 | Location : 13° 4′ 1.866″ N 74° 59′ 43.674″ E | Shutter speed : 1/125s | Images and content Copyright © Krishna Mohan. Please contact me to purchase prints or for image publication license. Lovely collection Sir…what type of diffuser you used here?